RAD Studio XE2 allows creating applications for Mac OS X. But the problem is that RAD Studio XE2 (both Delphi XE2 and C++Builder XE2) can be installed and run only under MS Windows, therefore applications for Mac OS X can be developed under MS Windows. That is why many people may face the problem of deploying applications on Mac OS X. Taking this into account, we decided to write this article that will help our users deal with deploying problem and deploy their applications to Mac OS X successfully. In this article, we will tell about two ways of applications deploying on Mac OS X and the peculiarities that must be taken into account during deploying applications that use Devart Data Access Components and Devart dbExpress drivers. The easiest way to deploy applications to Mac OS X is to deploy them using PAServer. When PAServer is used to debug applications on a remote computer with Mac OS X, it copies executable Mac OS X application packages to the “PAServer_Installation_Directory” directory (where “PAServer_Installation_Directory” is the “/Users/$USER/Applications/Embarcadero/PAServer” directory by default). In the scratch-dir directory PAServer creates directories with names, that consist of the computer name and the remote profile name. For example, if the computer name (where RAD Studio XE2 is run) is “MyPC”, and the remote profile name for the Mac OS X platform is “Mac OS X”, PAServer will create the “PAServer_Installation_Directory/scratch-dir/MyPC-Mac OS X” directory. In this directory, PAServer will create an application package with the name of the project plus the “.app” extension. For example, if your application name is “MyProject”, PAServer will create the “MyProject.app” application package. You can use PAServer for both debugging your application and for deploying it as well. For this, you should choose Release Build Configuration and run it without debugging (the Run Without Debugging command from the Run menu). Also, before the final deployment, you should clean the application package folder (for example, “MyProject.app”) from all old files that could remain after previous runnings and deployments. Note: You can choose files to deploy in an application package by selecting “Deployment” from the Project menu in RAD Studio XE2. Note: To view the content of the application package in Mac OS X, you can right click on package and select “Show Package Contents” from the shortcut menu. 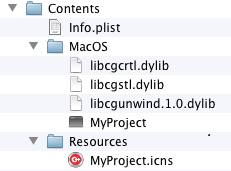 copy the “MyProject_DirectoryOSX32ReleaseMyProject.icns” file to the Resources folder. After performing these steps you can run the MyProject.app application package on Mac OS X.